You can download a Joomla version and Wordpress below, included tutorial guides you through the installation. Login to your Facebook account and you will need to create a New Facebook Page for your website, the fastest way is to click on "Search" field and start typing : Create New Facebook Page and enter. On "Create a Page" page, you can select to create an Official Page or Community Page. Fill neccessaries information for your page and click on "Create Official Page" or "Create Community Page"
On the Left side, click on "Edit Page"
Install Facebook Like Box for Joomla or Wordpress which you have downloaded. 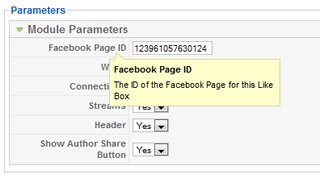 For Facebook Page ID, you can fill it with the same page id you have created on your Facebook page. For the rest of fields are quite self explanatory. check joomla folder access right on your hosting env. you will have the same problem by installing other modules & components. Re:Facebook Like Box \"Install failed\"
I just installed the Facebook like box for joomla 1.5. Unfortunately the extension don't validate with webstandards. Line 893, Column 267: there is no attribute "allowTransparency"
"You have used the attribute named above in your document, but the document type you are using does not support that attribute for this element. This error is often caused by incorrect use of the "Strict" document type with a document that uses frames (e.g. you must use the "Transitional" document type to get the "target" attribute), or by using vendor proprietary extensions such as "marginheight" (this is usually fixed by using CSS to achieve the desired effect instead)." in the fb feed module only the own messages are shown, not the ones from friends. on fb, default view is to display all in the feed. how can this be changed in the module, i did not find anything similar in the settings. Is there a way to change the size of fans profile pictures? I installed the Facebook like module but there is a verification required link displayd in. How can i finish that verification ? I really would like to change the css of the module. I tried what you have suggested, but unfortunately I'm not to good with CSS. It would be great if you could let me know a bit more in details how I could change the .css file to have more control over the module. hey guys, those Facebook's avatars are displayed back and kicking again ! I wanted also add a css class suffix to the module. I solved this by adding a plus line in the *.xml file. I have a question. 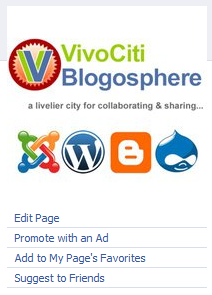 I have seen that the little thumbnails of the Facebook fans disappeared from the module box (also on vivociti.com). Is this a problem of my browser/network/etc.. or is it a global bug? Thank you forward for the answer. Nice module. Is there a way to add module suffix to use template styling parameters? have not played much with the css yet and maybe you can find it from facebook if there is a way to customize the css for your own. i have quoted some part as an example (using Firebug), as you can see , is controlled by UIStory_Message class comes directly from Facebook. the Joomla mod itself is very plain and no css hardcoded and this is going to be even more cool if you can customize its css directly from your facebook page. pls share with us if you have managed to do so. Yes that did help thanks. i think you are planning to install the same module but for different page ? 3. Joomla will create a copy of the same module, you can rename etc. 4. Click on the copied module and maybe you can set the Page ID to a different page. think this should work out nicely. Is there a way I can install multiple Like Boxes on one web page? I know it's a strange question, just want to know if it's possible and if it is, how?